We do a lot of open ended play on the light table, but sometimes I also like to use our light table as a way to learn practical life skills. 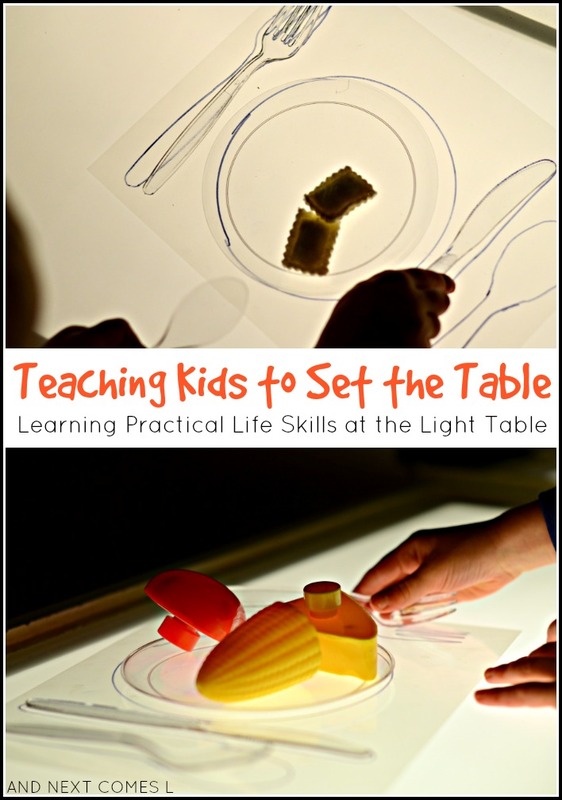 So here's a simple light table activity to teach kids how to set the table. To set up this activity, all I had to do was trace all of the cutlery and the plate onto the transparency using a permanent marker. Naturally, you need to put food on the plate once the table is fully set. Here the boys added some of their felt play food. K even took the opportunity to practice some fine motor skills by cutting up his felt ravioli. Then J added some of our plastic play food. I love how it just glows on the light table! Great idea! Your felt food looks fabulous, too!